Today I’d like to share with you some of the benefits of the 5-point ear acupuncture protocol called “NADA”. NADA, which stands for National Acupuncture Detoxification Association, works by increasing the Yin energy of the body thus promoting an internal sense of peace which improves concentration and sleep, and reducing the need to find “peace” through external substances such as cigarettes, drugs, and other behaviours that may become addictive such as over-eating, gambling, etc. The ears are associated with the Kidney/Water element in TCM which is Yin. Similar to foot reflexology, the ear is a micro-system of the entire body so for every body part there is a corresponding ear point to stimulate it. Below you will find a description of how each acupuncture point addresses Yin deficiency to calm the system physically, mentally and spiritually. You will also find a recipe for Sleepmix tea, the herbal formula developed by Michael O. Smith to support this treatment. 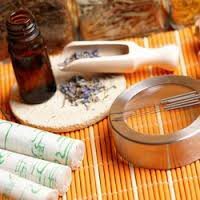 Also, please note that acupuncture treatment can be used concurrently with prescription medications. In modern times, our nervous system and mind tend to get too Yang due to our fast-paced living, busy schedules, mental distractions, lacking connection to Yin things such as the Earth, silence). Too much Yang “burns up” the Yin and so Yin deficiencies are extremely common. NADA is now being successfully used for various Yin-deficiency conditions such as insomnia, improving concentration for students and those suffering from ADD, stress reduction, night tremors, various behavioural disorders including suicidal ideation as well as recovery from traumatic events such as war and crises. Body – regulates the sympathetic nervous system, controls pain, relaxes tension in internal organs, dilates blood vessels. This tea is a Western herbal formula used to reduce insomnia, improve digestion, lower stress, aid in detoxification, and increase feelings of relaxation. Use 1 Tablespoon of herbs per cup of boiling water. Let steep for 5 minutes. Can be used long-term and won’t cause morning drowsiness. It contains no caffeine.